Kenny has just about finished round one of his plowing, tilling and planting… the gardens are finally planted. He worked all day Sunday and into the evening getting his plants in before the rain. What rain you ask? Well, we finally got about a tenth of an inch Monday evening… so the irrigation continues. This week we will be taking orders for the greens we have available… spinach, kale, black seeded Simpson and mixed baby lettuce. 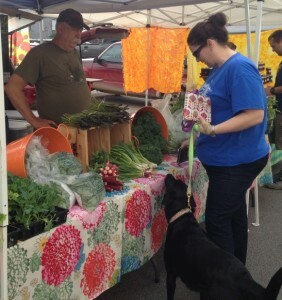 Kenny will also have asparagus, rhubarb, radishes and more green onions. Basically a repeat of last weekend. Just a reminder that we have been selling out early… so come early or pre-order to make sure you get the items you need. We will have plenty of fresh herbs and garden plants available this weekend… basil, dill, parsley, cilantro, oregano, thyme, sage, Stevia and rosemary. Kenny also has a nice variety of heirloom tomatoes, red tomatoes and pepper plants. We will also have some of my winter craft projects available… items made from recycled materials, Fairy Wands, Grilling Planks, relishes, jams and jellies.